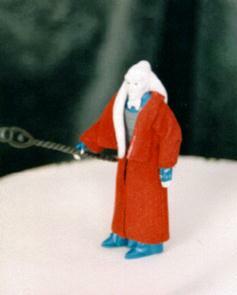 Red Cape Bib Fortuna: This is the legendary red cape Bib Fortuna. Contrary to popular rumor, this was never released on card. It was featured in Kenner photography on the 77-back cards and on JC Penney multi-packs. There are lots of fakes of these out there.